Dust-like material sparkles for many team members in memory of a man, Henry "Hank" Moore, who dedicated much of his life to the exploration of the martian surface. 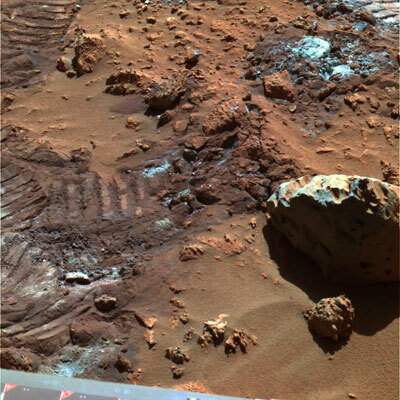 This false-color composite panoramic camera image highlights mysterious and sparkly dust-like material that is created when the soil in this region is disturbed. NASA's Mars Exploration Rover Spirit took this image on sol 165 (June 20, 2004) in "Hank's Hollow," using filters L2, L5 and L7. This feature was named after the late Henry "Hank" J. Moore II, who was a Viking Lander mission scientist and the Rover Scientist on the Mars Pathfinder mission, with expertise in soil physical properties and volcanology. The science and engineering teams have creatively used both rovers’ wheels to dig "trenches" in the dirt to further discover what lies beneath the dust-covered surface of Mars.